This great section of the Finger Lakes Trail / North Country Trail begins as the trail leaves Sand Pit Road near Bath, NY. Most of the trail in this section is located on PRIVATE PROPERTY. There is no camping or fires allowed anywhere along this section of trail, except at the Hickory Hill Lean To. There are numerous fantastic views. This stretch of the FLT/NCT is featured on map M12 from the FLTC. The trail ascends up Kershener Hill as you leave dirt Sand Pit Road behind you. There are views almost immediately as you ascend. Better views to follow as you walk along the edge of a cornfield after 0.65 miles of hiking (see panorama below). You'll pass a small pond on your right and then come to an opening at 1.55 miles, which is a trail that leads steeply 0.7 miles to Hickory Hill Campground. More views soon after going under power lines as you walk briefly in a field. Soon after a right turn reach the Hickory Hill Lean To on the right at 1.75 miles. This lean to was built in 2011 and features a privy, picnic table, and fire ring. After 2.55 miles reach a trail register and reminders of no camping/fires along this section of trail. There are some views about 50 feet from the trail as you skirt a corn field. Then you'll skirt by a "pit" before starting to descend toward Robbins Road along an old road. After 3.05 miles reach dirt Robbins Road and a parking area. The trail follows the dirt road for 0.3 miles before veering into the woods at the bend in the road. You'll pass near a home as you ascend along the trail before entering a large field at 3.9 miles. Soon the views open up as you walk along the edge of the field. At 4.35 miles there is are two perfectly placed stone benches that allow you to rest and enjoy the spectacular view that engulfs you (see panorama above). It's just a short walk before you enter the woods at a trail register and the "Pucker Bush Overlook". 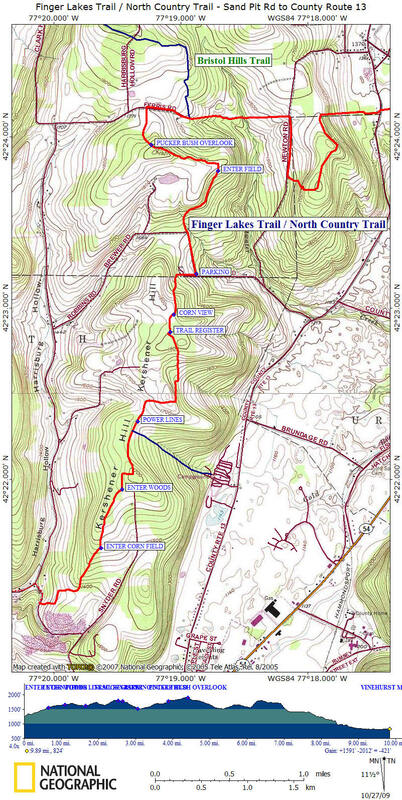 At 4.7 miles the trail reaches the rough seasonal dirt Ferris Road and at 5.0 miles reach the junction of the southern terminus of the 50+ mile Bristol Hills Trail on your left. The trail briefly follows an even rougher seasonal dirt Newton Road before ascending a hill before steeply descending toward County Route 13. The trail crosses County Route 13 into a field before crossing a stile next to a gate then entering the woods and the start of the Mitchellsville Creek Gorge section. The trail will gently drop over 600 feet in elevation over the next 2.2 miles as you walk in this scenic, relatively unknown gorge. The trail walks along the rim of the gorge and has numerous views of waterfalls. You have the sound of Mitchellsville Creek as you hike along the gorge. There are views of the gorge as you hike. The trail briefly follows the old railroad track of the Bath & Hammondsport Railroad. The Bath & Hammondsport Railroad was officially born in 1872 when approval was given to operate a railroad between the two towns. The proposed railroad would be be a total of 9 miles in length, connecting with the Erie Railroad in Bath, and Keuka Lake in Hammondsport. Construction was completed in 1875. Today the B&H is still in business, however this nine mile original track is not in service. 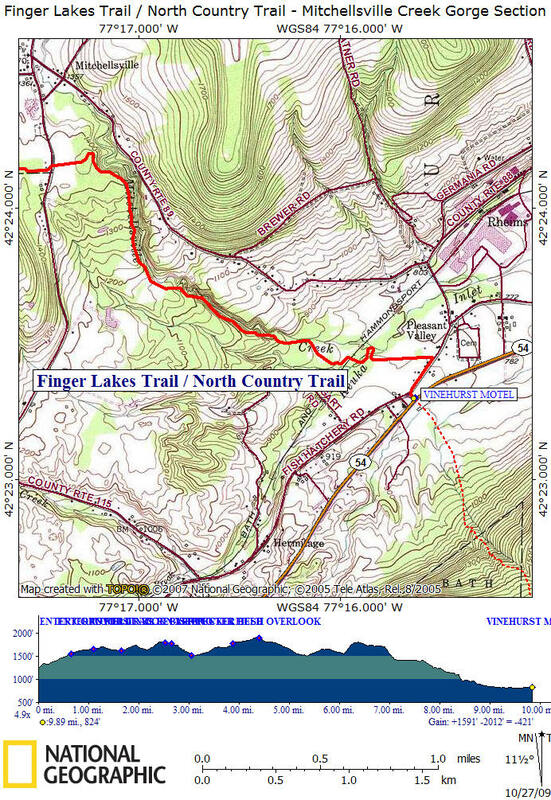 The Finger Lakes Trail / North Country Trail takes you along the old tracks briefly as you make your way toward the Keuka Lake Inlet. The trail re-enters the woods and crosses Keuka Lake Inlet on a footbridge. You'll walk along a vineyard prior to reaching County Route 88 and good parking along the side of the road. This section ends as the trail crosses busy NY 54 and skirts the Vinehurst Motel, which is a popular stop for thru hikers. There is also the Pleasant Valley Inn located at the corner. Look below for a couple of pictures, videos, maps and a detailed description of this section of the trail. Parts of this section are included as "Best of the NCT in New York". This section starts as the trail turns left off Sand Pit Road. Follow white blazes. Hiking on PRIVATE PROPERTY. Ascend. Parking along shoulder of road. There is NO CAMPING or FIRES allowed on this section of trail. Trail turns left. Soon views to your left. Entering edge of corn field. Follow edge of field. Soon great views to your right and behind you. Pass pond on your right. Opening. Blue blazed (hard to see blazes) trail on your right leads 0.7 miles steeply to Hickory Hill Campground. Trail turns right, enters field, reaches Hickory Hill Lean To and then re-enters woods. View 50 feet left of trail in corner of corn field. Soon enter edge of "pit" before descending on old road. Trail veers right along old road. Look for old wall on your right prior to turn. Reach Robbins Road. Parking. Turn left and follow dirt road. At bend in road, trail goes straight into woods following old woods road. Limited parking on side of road. Trail enters field. Trail follows edge of field, then dirt road along edge of field. Views start. Continue to follow dirt road along edge of field. Pucker Bush Overlook. Trail Register. Last of the views. Reach seasonal dirt Ferris Road. Turn right and follow dirt road. Parking only possible 0.6 mile to the west on the corner of Clark Hill Road. Junction with orange blazed Bristol Hills Trail on your left. Turn right on rough seasonal dirt Newton Road. Poor parking. Very rough road, especially from the south. Trail turns left off Newton Road. Steeply ascend. Top of hill. Follow ridge with some views through trees. Trail turns right and steeply descends hill toward County Route 13. Cross County Route 13. Enter field. Parking along side of road. Cross stile next to gate. Enter woods. Start of the Mitchellsville Creek Gorge section. Descend. Over 600 foot elevation change in 2.2 miles to Kueka Lake Inlet and County Route 88. Popular section of trail. Trail register. NOTE on 10/29/09 there was only a mouse nest in the register. Turn left on old railroad tracks, then real soon right off tracks. Cross Kueka Lake Inlet on footbridge. Trail will soon go thru vineyard to County Route 88. Turn right on County Route 88. Parking. Reach NY 54 and the end of this section. Trail crosses road . Parking. Vinehurst Motel next to trail.